From a photo shoot to two events in one day – it was a whirlwind. But a great time was had all around. 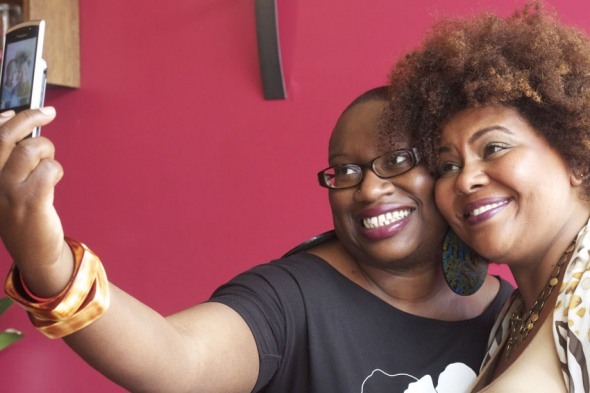 Afrobella touched down in Toronto and those who came out enjoyed a day of inspiration, beauty, laughter and all-around fabulousness. The events were hosted by the fabulous Janice James-Brown from FAB Couture and she was absolutely superb. Entertaining, vivacious and simply perfect. Afrobella answered questions about her upbringing and introduction to all things beauty, being radiant and beautiful from the inside and out and how health is an important component in everyone’s beauty regimen. Before I leave, I have to send out my gratitude to everyone who donated or took part in Soulafrodisiac Sessions Presents: Brunch & Beauty With Afrobella and Dinner Delights With Afrobella. Thank you to my photographer Tanya Petraglia from TP Photography (you’re amazing at what you do!) and thank you to Lady Vee for all of your tireless assistance. I have to send a huge thank you to all of my sponsors. Without them, the event would not have been possible at all. My key sponsors: The Trane Studio, Honeyfig and Toronto Natural Hair & Beauty Show! And lastly, I’m sending a huge thank you to my girl – the lovely Afrobella. It was a pleasure having you here in Toronto! We look forward to having you back soon. Thank you so much for launching my series!! I appreciate you!